This letter will serve to act as confirmation of the wonderful and seamless process we experienced when selling our most recent home with Mario and Mimma Volpentesta. We met both Mario and Mimma almost 15 years ago, as they were listing agents for a house we were considering purchasing in Vaughan (which we ultimately did purchase through them). We asked them if they could list our home, as we felt an instant rapport with both of them and were duly impressed with their knowledge of home values in our neighbourhood. Our house went on the market and sold in 4 days, over asking price. Their marketing strategy generated multiple offers and at no step in the process were we pressured into making a decision we weren’t completely comfortable with. We were thrilled with their customer focused service. Fast forward 15 years. We had decided to sell the home we purchased through Mario and Mimma. When thinking of real estate agents, we had only 1 team in mind…the Avanti Team. We contacted Mario and Mimma and booked a market evaluation for the following week. They arrived fully prepared with local comps, recent area sales, marketing materials and brochures (completed on other homes they had listed). We were utterly impressed with their marketing strategy for our home and thrilled with the value they placed on our property. At every step in the process, they kept us updated and included us in decision making. Not many real estate agents place such a high standard on commitment towards their clients, Mario and Mimma are those agents you can only dream of having…they certainly make you feel valued by asking for your feedback at every step. Part of the Avanti experience is that they offer stagers, to maximize the value of your home, free of charge, all while being cognitive of our feelings for our things! The stagers were fantastic and efficient! We followed Mario and Mimma’s recommendations explicitly and it paid off. Our home went on the market, an open house was booked for the weekend, and our home sold 6 days after being listed, over asking price. They even conducted a live, virtual tour on open house day. The quality of their marketing material is second to none (even our neighbours were impressed) and their virtual tour hi-lighted our homes strengths. If you want to sell your home with professionals who value your opinion, keep you updated, provide feedback, and are committed to selling your home, look no further than the Avanti Team. The Avanti team is a formidable team! A gracious thank you to Mario and Mimma for their unparalleled expertise and persistence in selling my home. Given the busy demands of my family's lifestyle, Mario and Mimma were so accommodating and willing to work with me to overcome those obstacles. Thank you for your professionalism and patience. We would like to express our sincere appreciation for all your help and guidance in the sale of our home this spring. Selling a home is a daunting task. Both of you and your team made the process much easier for us. We have very busy lives so we can’t thank you enough for your help in getting the place ready for sale. Your professionalism, knowledge of the market and how best to showcase our house helped us to achieve our goals. You both clearly put a lot of effort into providing excellent customer service for your clients. We commend you for your attention to detail and your responsiveness to our needs. Our thank you is also extended to all the members of your team including the cleaners and stagers and office staff that made our experience a pleasurable one. It has been a pleasure working with you and we we highly recommend you for anyone selling or buying a home. We wanted to thank you both for the excellent service and results you provided for us with respect to the sale of our home. After interviewing several other real estate agents, you both came across as the most knowledgeable, most professional and simply the most friendly people to work with. You were clearly excited to sell our house and we have now seen the level of effort you both put into the sale of homes. You both made what could have been a very stressful time a quick and efficient process. Wanted to express you our gratitude for getting the best value for our property in such short period of time. When we met with you passed Tuesday we could not have imagined that in less than a week (today is Monday following week) you will succeed to stage our house , develop excellent marketing media , set couple of dozens showings , organize high traffic Open house and finally coordinate fair and efficient bidding process culminated with secured offer significantly over asking price. All this with highest level of professionalism towards all potential buyers and their real estate agents. Time of the year (end of November ) and rumors about market slow down were not a factor for you. It is the second house you help us selling in last 7 years, both over asking price . Please expect a call from us when we will be selling our next property. We have been recommending your services to our friends since the first transaction in 2010 and will continue doing so going forward. We lucky to have you as our real estate agents. ~~In selecting a real estate expert, my wife & I had three main criteria in mind; namely: experience, professionalism, and most importantly the ability to deliver against our desired results. I can say without reservation, that ‘the Avanti team’ over-delivered on all three criteria. More specifically, the hopes (& fears) that my wife & I had entering into the process of selling of our current home, and in the purchase of a new home, were effectively addressed. Most importantly, the Avanti delivered against all of the goals that we had set out to achieve, and in a manner that was relatively simple and stress-free. Sam and I would like to thank you guys for representing us in the sale of our home. Your kindness and professionalism make us feel we are in good hands. Your assurance to us that you will do your best to get us the best possible price and you did. Thank you both, we very much appreciate your services. With respect to your office staff, the girls were very friendly in their greetings, no matter how many times they have to call us for a viewing, they always sounds so friendly which tells us they take great pride in doing their job. Thank you girls. We recently purchased a home from the Avanti team. Never have we met real estate agents that were as honest and knowledgable as they were. They truly are professionals who work with you and listen to your needs. They made buying our first home an enjoyable process. We will definitely use them again in the future! Thank you Mario and Mimma for helping get us into our dream home! When it came time to put our home up for sale, my husband and I were very apprehensive with our choice of Real Estate Agents. It’s kind of a jungle out there because it’s such a competitive market and field. When we first met with Mario and Mimma Volpentesta, I immediately felt a connection with them. They were very honest with us in regards to our home and the value it carried. They both came across as friendly and well educated individuals who are well versed in their field. You could tell that they are very successful in their business because they understood our needs and they listened to our concerns. After our discussion of the listing of my home, Mr. and Mrs. Volpentesta made the process quick and easy for us. They understood that I have physical limitations with having severe back pains and purchasing and selling a home had become such a stressful time for me. Their actions were quick and efficient by bringing in a team of people who helped to clean, de-clutter and stage our home. By the time they were done, I almost didn’t want to list anymore. They had done such an amazing job and were extremely helpful. That same day the photographer came in and took such complimenting pictures of our home. Within 2 days we received an offer and sold. I want to thank the Vopentesta Team for making this most stressful period a smooth transition for myself and my family. I have nothing but positive feedback in dealing with Mario and Mimma, from their fabulous touch in advertising our home, for their low commission they offer, and for being such down to earth people that I could relate with. Thank you for selling my home quick and painless. 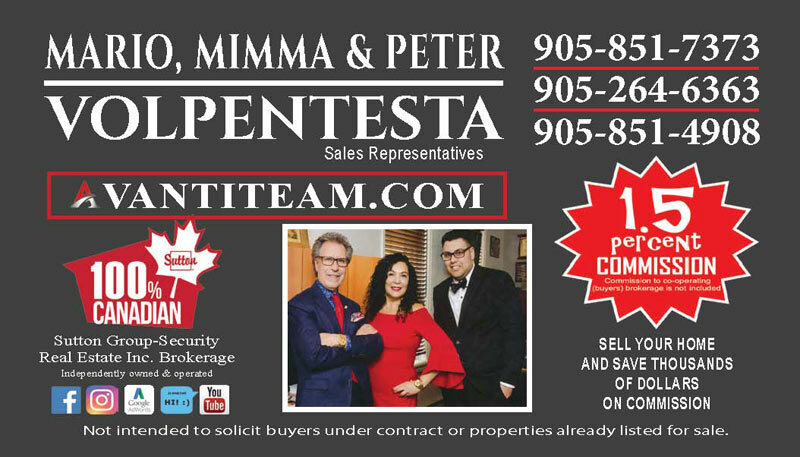 I would highly recommend Mario and Mimma Volpentesta to anyone selling or buying their home. We would like to thank you for sending Maria and her staff to organize our house for sale. They were truly amazing we would not be able to get the house for sale without them. Thank you Mario and Mimma! You are by far the best real estate agents I have worked with, which is why I have come to you every time. Your experience, incredible attention to detail, excellent follow-through, and personable manners are truly appreciated. I would highly recommend you to anyone, as it's always been a pleasure working with you. From the moment we met you until the time we closed on our house, you have exemplified professionalism. You provided meaningful feedback, informed advice, and a listening ear to all of our questions and concerns. This is extremely rare nowadays. You and your entire team exemplify good business in the city of Vaughan. Thank you again for marketing, selling, and closing the deal! My family and I would like to thank you from the bottom of our hearts for everything you have done for us. From the first day we met, we knew you two were the best real estate agents we have ever met. You were professional and very caring throughout the whole process of selling our home. The two of you and your team went that extra mile to find a buyer for our home and in the end we received multiple offers. We will recommend you two to anyone that is trying to sell their home. The market valuation of our property was a very positive experience where the true selling features of our home were identified and showcased. We were extremely impressed with the quality of the virtual tour developed by a professional photographer and the elegant brochures of our home designed to highlight key selling features.The services provided by the Avanti Team were exceptional. We just wanted to say how glad we are we chose you to sell our home. We heard a lot of good things about the both of you and its true. You made the selling process of our home very easy. We thank you so much for everything and also the fact that the house was sold in less than 9 days. We would defintely recommend you to our family and friends. All the best in the years to come. Sold over the asking price. Listing our home with Mario and Mimma Volpentesta was the best decision we could have made. This dynamic duo had our house sold within 5 days for more than the asking price! They are extremely knowledgeable in their field and know what it takes to get the job done. Selling a house can be extremely stressful and intrusive but Mario and Mimma had the utmost respect for our privacy and didn't waste our time with gimmick. They are true masters at their craft. We were extremely impressed with the service we received and would recommend them to anyone serious about selling their home at an optimum price. In February 2012, we had scheduled meetings with three real estate agents in order to sell our house located in Sonoma Heights , Woodbridge. All three agents claimed they were specializing in the Vaughan area. We had done research on the internet, therefore we were aware of the market in Woodbridge and felt prepared to discuss selling of our house. After interviewing these agents, we realized that their service would be below our expectations, while charging the highest commission. Usually after 15-20 minutes of conversation we were certain that we wouldn’t hire any of them. We then called Mario and Mimma Volpentesta and another agent for the area. Mario and Mimma visited us the next day and they showed us a report with full market analysis including suggested price. During their professionally conducted presentation we asked them without hesitation to prepare a contract and signed it the same day. We also cancelled our meeting with the fifth agent. The next day, a professional photographer took the pictures and I was informed about viewings on the first day of the contract. After four days on the market, without an open house, we received our first offer and Mimma scheduled a meeting to discuss this offer that evening. When Mario and Mimma arrived at our house, they presented us two more offers. We sat at the table and discussed one offer below and two offers over the asking price. It is hard to describe the comfort we felt during negotiations. We could trust the professional and sincere advice, warnings and suggestions. We also felt we were in good hands, given answers before we had to asked. After four days our house was sold for 1% over asking price without any compromises. We would highly recommend Mario & Mimma’s service if someone is looking for quality work and honest appreciation of their investment. We would like to express our gratitude for your excellent service in both finding our condo and selling our home (over asking price) in such a short time. Your advertising, professionalism, and friendly approach alleviated what could have been a very stressful experience. We highly recommend you and your team to anyone who is seeking to relocate. We just wanted to say how glad we are we chose you to sell our home. We heard a lot of good things about the both of you and its true. You made the selling process of our home very easy. We thank you so much for everything and also the fact that the house was sold in less than 7 days. Over the asking price. We also wanted to thank you with your assistance in the purchase of our new home. You were very patient and showed us many homes. We can't wait to move in to our new home. My husband and I would like to thank you from the bottom of our hearts for selling our home and helping us purchase our new home. This process was extremely difficult for us because of my illness. You were both patient and understanding and walked us through the process with helping and guiding hands. Thank you for your wisdom, honesty, efficiency and personal touch. We are now exciited to move into our new home with our three children and our little dog. Es la primera vez que vendemos una casa y realmente Mario y Mimma nos explicaron absolutamente todo lo que teniamos que saber. La casa se vendio enseguida, sin ningun problema. De mas esta decir que la proxima vez que necesitemos un real estate, no vamos a dudar en contactarlos nuevamente. Excelente servicio y maravillosa atencion. Muchas gracias! We are extremely satisfy & will recommend you to all our friends & family again special thanks to you & your team. Cam on Mimma & Mario rat nhieu ve viec ban nha vua qua. Su sap xep, don dep nha cua, chup hinh nha de dang quang cao... da lam can nha nhin rat dep, rong rai va sach se nen chi trong vong 4 ngay ma khoang 30 nguoi toi xem nha. Ngay thu 4 thi co toi 4 cai offers cung mot luc, khong ngo gia ban lai cao hon ca asking price. Neu ai mua nha thi xin gioi thieu day la hai nguoi real estate agents chuyen nghiep, rat nhieu kinh ngiem va rat vui ve. Once again thank you very much for the good work. accommodating our crazy schedules! Best of luck in the future! Thank you once again for the wonderful service you provided to us for selling our home. Your many years of experience definitely was a contributor to how quickly the sale was done! Sarah, Mario and Mimma Volpentesta are true experts in their field and we are grateful for the urgency they showed in selling our property at the best possible price. From the very first meeting, we felt confident that their knowledge of our neighbourhood and community would yield us great results. And, we have not been disappointed. In a tough economic market, the pricing strategy suggested by The Avanti team produced 11 offers on our home within 5 days and a sale price of 108% of asking.Truly amazing results delivered by a truly amazing team of professionals. The market valuation of our property was a very positive experience where the true selling features of our home were identified and showcased. We were extremely impressed with the quality of the virtual tour developed by a professional photographer and the elegant brochures of our home designed to highlight key selling features. The services provided by the Avanti Team were exceptional. During negotiations with buyers, we were reassured by the fact that we were represented by a "team" of experienced Realtors that had our best interest in mind. We were set at ease through the negotiation period and we were thrilled with the results. Well done Avanti Team!You have earned Realtor of the Year in our books. Without hesitation, we will recommend the Avanti Team to our friends and family. Hi Mario & Mimma, I want to let you know that I appreciate all the efforts you put in the sale of my property. I was happy that the property was sold under 7 days. May you continue to grow. You are awesome!!! Everyone we know who has sold a home, explained how stressful and draining the process would be. We were fortunate not to have that experience as ours was exciting and effortless! This is thanks to The Avanti Team. Prior to listing our home with your agency, you provided a strong and direct action plan to selling our home. What we liked best about your team was that your plan didn’t include issuing a to-do list for us the clients - as other realtors had given. Instead the to-do list was passed off onto your team. As my husband and I are both employed full time and raising a young toddler, knowing that the home preparation and property maintenance during the listing period would be taken care of by your team alleviated a great deal of pressure on our family. The team that you brought into our home was respectful, courteous and most importantly did a great job! Even your office staff was extremely polite and helpful and always made us feel welcome when we called in to discuss showing appointments. You made a great deal of promises during our initial interview and you delivered on all of them. When we read your advertisement, we believed that a lot of your services would come with strings attached - but they didn’t. We can attest that many of the items you listed on your ads were utilized during our contract. What we liked most was that we never had to ask for anything – you would provide all the necessary information and complete the work before the question was raised. Your attention to detail, professionalism, humor, and the comprehensive analysis of the properties in the area (both past, current and on-going) made us able to relax and relinquish control to your team smoothly and with ease. Thank you for selling our home in one week and for over $20,000 above asking price! We will defiantly be recommending your services to anyone we know who will be selling their home. Please feel free to use us as a reference if ever you would need one! We would like to take this time to thank you very much for your knowledge & dedication that went into selling out home you were able to provide a fast sale & were able to get us multiple offers & OVER $20,000 OF ASKING PRICE for our home in 7 days . We will refer you to our friends & family thanks again. We wanted to share with you what a delight it was to have you represent us in the sale of our home. Your patience, knowledge and dedication went above and beyond and we are truly grateful for the outstanding results you achieved for us. Multiple offers are every sellers dream and you were able to present seven of them to us the second day after you listed our home. Your professionalism has secured our confidence and trust in the Avanti Team. We would like to extend a very warm thank you from the bottom of our hearts. We wanted to thank you for all of your efforts in terms of selling our house. We are still in disbelief that even though we are in a recession, our house sold for OVER ASKING in only FIVE days! We know that this would not have happened had we decided to go with another agent. We took great pride in our house and were determined to sell it for the best possible price despite the unfavourable market conditions. We were very meticulous with our research and interviewed 5 prominent real estate agents in our area. Out of all the agents’ analysis of our home, yours was the closest to our own. Most agents were very discouraging and tried to persuade us to under-price our house. They felt that because of the market and time of year our house would only sell for $40-50K less than what it actually sold for. You were very knowledgeable about our neighbourhood as well as the important selling features of our home. Not only that, you had a pool of serious buyers that were interested in our home. You were very confident that you would be able to sell our house at the price WE wanted to list it at. You listened to all of our concerns and thoroughly answered all of the questions that we had. Once we decided to list with you, your team worked quickly and efficiently and came up with an incredible strategy to sell our house. And it worked!! All in all we would have no hesitation to recommend the Avanti team to our family and friends. You are professional, friendly, and genuinely care about your clients. You made selling our home a stress-free process. It’s been a pleasure working with you. Thank you once again! Mario & Mimma Volpentesta are celebrating 23 Years in the Real Estate Profession! It's that time again to celebrate another fabulous year … as the Avanti Team turns 23! This past year we serviced many new clients in Vaughan and surrounding areas. We are very proud to have met and created working relationships with many fabulous clients. Good old fashioned "service" and hard work is what our team is all about. Over the years, we have expanded our marketing plan so that it is now one of the most extensive and includes Virtual Tours, Home Staging, Internet Exposure, Major & Local Newspapers, Real Estate Magazines (eg. Homes & Land Magazine) and much more! Our creative marketing plan helps ensure that your home is sold for top dollar! We truly thank you for your business and we look forward to working with you again in the near future.